A book-reading service where a child and a distant relative can read a book together in real time by each opening up this free app. 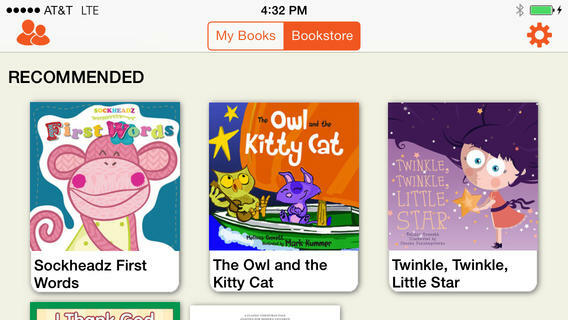 The book appears on the screen of each idevice to be read aloud while the two snuggle up in a video chat. This is the perfect app to download if you are traveling and want to have a joint story time with your child. It is also a good way for grandparents to connect to their grandkids. 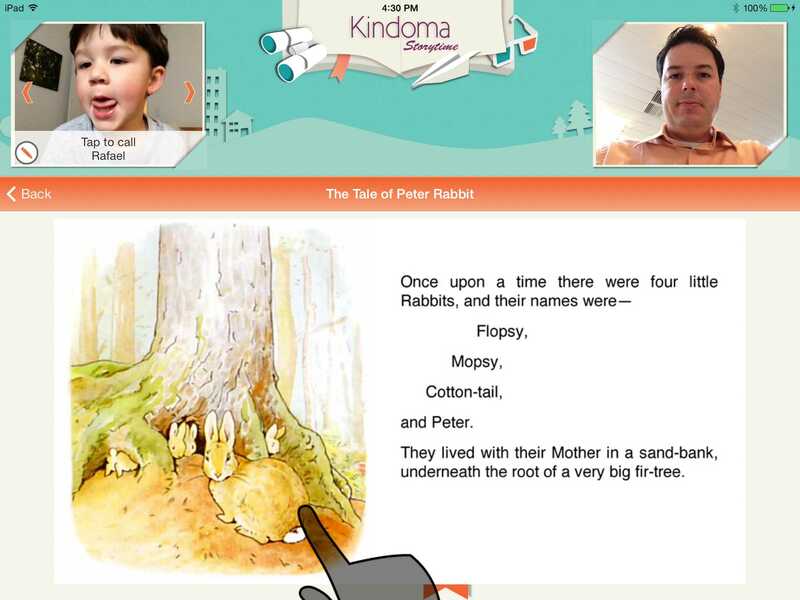 This app provides a parent, grandparent, or other physically distant relative with a way to read a story together in real time, while seeing each other in a video chat format. The app operates like Facetime in the sense that you see videos of each other up in the upper right and left corners, but the main screen shows the book you are reading together. On an iPhone or iPod Touch, you just see your relative, but don't see video of yourself because the screen is too small. The research motivating this app revealed that kids under age 7 have a hard time sustaining a phone call or video chat with a distant loved one. But when you provide young children with an opportunity to read books, their interest stays focused. This app gives an absent parent or distant relative the ability to read a book together, laughing and giggling as if they were in the same room. It even shows both participants the place where the other is pointing on the page. What a wonderful service this free app provides. This excellent service comes with access to over 10 free books; and you can buy additional books that cost from $2.99 to $12.99; or you can gain unlimited access to all of the 250 books for a membership of $6.99 per month. If you are going to be a regular user, this latter option is the way to go. 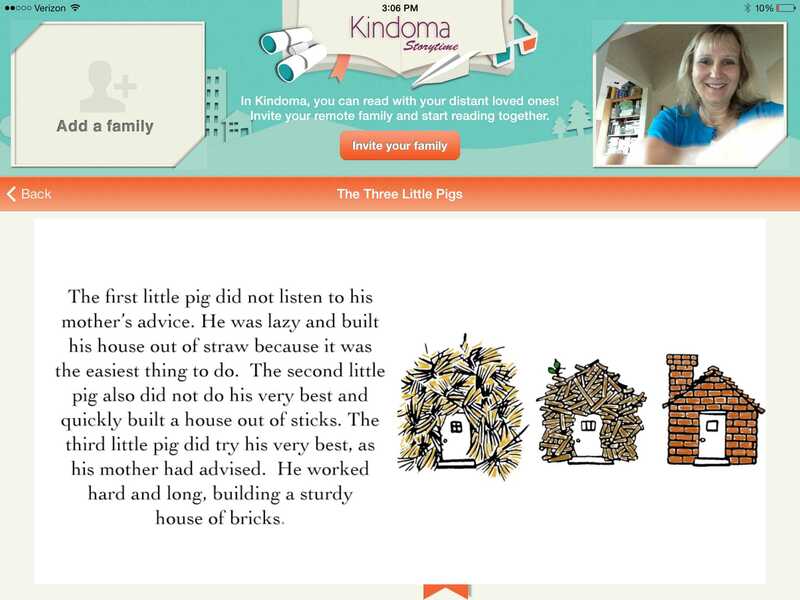 The concept behind this app is sheer brilliance; each of the two participating readers can see the other touching the screen, so the adult can ask the child to find things on the pages of the book; or the adult can point to items or words as they read together, thus allowing for fun interchanges involving questions and answers. There are currently over 250 books to choose from, including a cute rendition of the classic "Down by the Bay." Some of the books come in Spanish. An excellent features is the ability to filter by age, making it easy to find an age-appropriate book. Only one side of the video call needs to have the book, so both sides don't have to download it or pay for it. The service, which works using WiFi or cellular, has expanded beyond the iPad to now include the iPhone and iPod Touch, which makes it easier for the traveling adult. 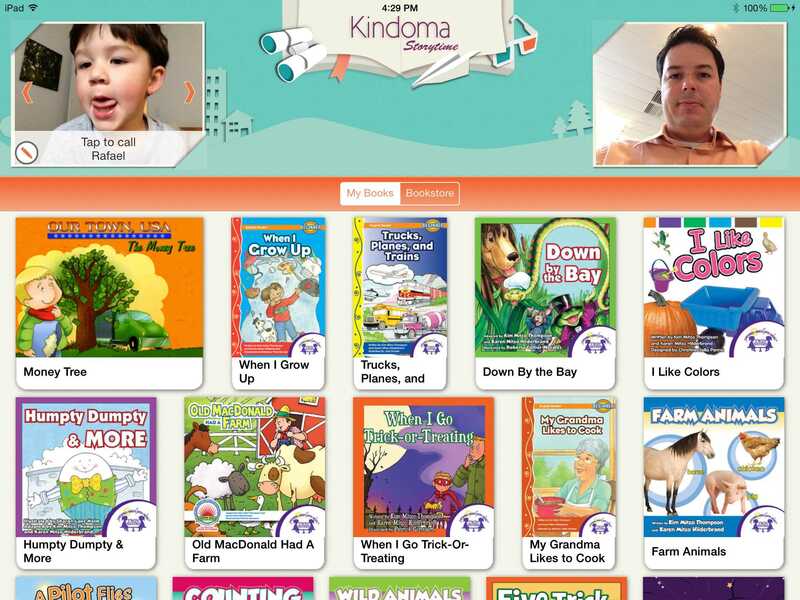 As compared to the similar ustyme, Kindoma Storytime has more books to choose from; and its pricing is more economical if you are going to be reading a lot of books. The unlimited access to its library costs $6.99 per month. Plus you get 10 free books versus ustyme's two free books and 1 game. 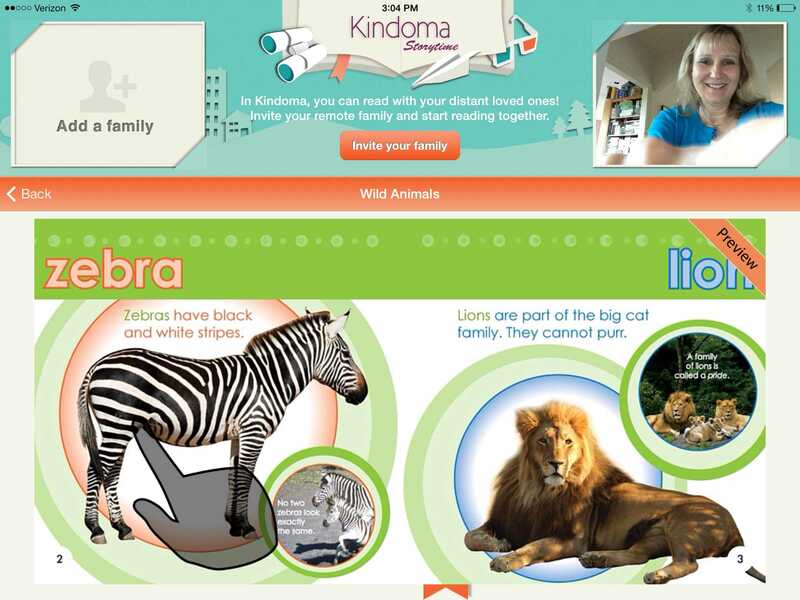 Families with distant relatives who are looking for a meaningful way to bond with children who are physically far away.